A Persistent Data Network (PDN) is a simple, secure and managed infrastructure communications network alternative for utilities. This consistent, always-on connection enables secure, cost-effective and managed access to remote equipment, whether it be for peer-to-peer or point-to-multipoint communications. A PUBLIC WORKS department on the East Coast of the U.S. has a new communications system in place to monitor its remote pump stations. 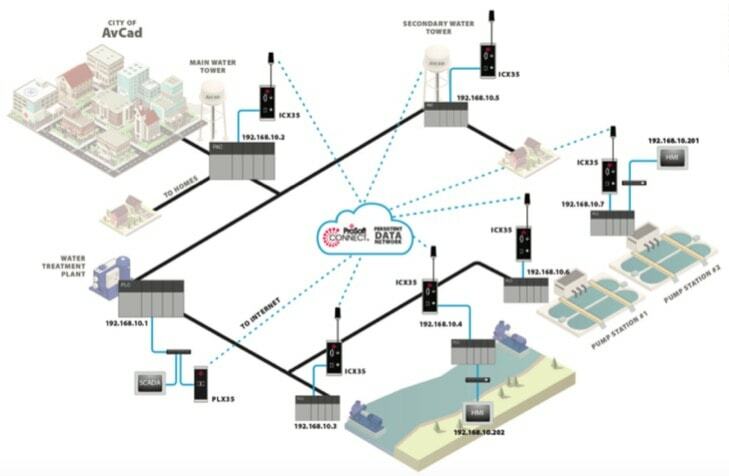 Cellular gateways connected to their PAC send on-site operational and I/O data back to the city′s central control facility at a rate set by the city. Data is received at the central hub several times per minute. This consistent, always-on connection is a hallmark of the Persistent Data Network (PDN), enabling secure, cost- effective, and managed access to remote equipment, whether it be for peer-to-peer or point-to-multipoint communications. It′s an ideal solution for small to mid-sized cities whose distributed water and wastewater assets require monitoring and an accurate notification system, but are not typically outfitted with the fiber optic Internet connectivity generally used for larger cities. It′s also an avenue to Industrial Internet of Things benefits for municipalities where resources can be scarce and need to be efficiently used. In this article, we′ll explore which cities would most benefit from this type of technology; its benefits over legacy alternatives; and the security and setup considerations you need to be aware of when selecting and implementing an "always on" infrastructure communications network. A persistent data network is ideal for municipalities with distributed water and wastewater equipment to monitor and maintain. The United States has a very fragmented water market, and the communications needs differ for large cities versus smaller municipalities. "Larger cities have the infrastructure to ensure Internet connectivity to their assets to facilitate communications between the remote assets and their central hub," said Vishal Prakash, Strategic Product Manager at ProSoft Technology. Big cities typically have more resources to meet the demands of a large-scale fiber optic-based communications network. That′s not always the case for smaller cities, Prakash notes, where personnel and resources could be fewer, workloads greater, and time in short supply. With these constraints, having a network infrastructure to manage in addition to handling other automation troubleshooting can be a burden that many small cities or towns would understandably find insurmountable. "For these smaller service areas, the communications network is the most important part of their entire operation, and also the most vulnerable failure point," Prakash explains. "The always-on nature of the Persistent Data Network provides a simple and secure approach to a managed infrastructure network. That in turn enables automation and controls engineers to focus on their areas of expertise – instead of having to find out why a pump station is unable to send data to the central location." Setting up an industrial infrastructure communications network is an incredibly complex, expensive, and time-consuming endeavor, Prakash added. "For many areas, the appeal of the Persistent Data Network is the fact that it′s managed for them, can be easily set up, and is secure." Alternatives that many smaller municipalities have in place already facilitate communications but are expensive to implement and – most crucially – maintain. These include licensed or unlicensed RF radios and leased line modems. These typically involve several different networks, increasing the complexity and costs of support and maintenance, and in turn those high and unexpected expenses can be a strain on CapEx and OpEx budgets. Relying on legacy solutions can also mean that the utility cannot take advantage of all of the features of newer field instruments – and the municipality could see operational efficiency plateau or decrease as a result. These options also don′t have the same reliability that cellular and secure cloud operations can provide. Cellular solutions, for example, can support 4G LTE communications, a must-have as 3G nears its sunset. Having a 4G-enabled communications network helps ensure longevity and reliability, and increased bandwidth allows users to bring back additional operational and diagnostic information from remote locations. Other alternatives that some utilities opt for include Multi-Vendor Network Operator (MVNO) or a home-grown engineered solution. The MVNO option typically requires complex configuration and a major IT commitment, and software that needs to be installed and maintained. Some end users may opt for the engineered solution, perceiving it as lower-cost, but the engineering and support expenses can be high, and it is typically not an industrialized solution, so its reliability and security may be lacking. An always-on network can be helpful for gas utilities or power plants, ensuring neighborhood safety and accurate records for regulatory agencies. The security question looms large for any operation, and especially water, wastewater and power utilities, given their heightened responsibility to consumers and regulators. Prakash explained that a major benefit of using a solution such as the Persistent Data Network is the fact that it does not need to be managed by the customer. "The water utility is able to focus on their control system," he said. "With a managed infrastructure communications network, there are very minimal IT requirements for configuration or maintenance. This allows the municipality to optimize their personnel hours." The ability to forgo PC software installation or updates on the part of the city also helps eliminate a common entry point for hackers. Prakash suggests using a solution that incorporates security features such as encryption, two-factor authentication, and a single-use key for tunnel connections. An audit trail of all activities is key. Separated control and data planes are also advised. 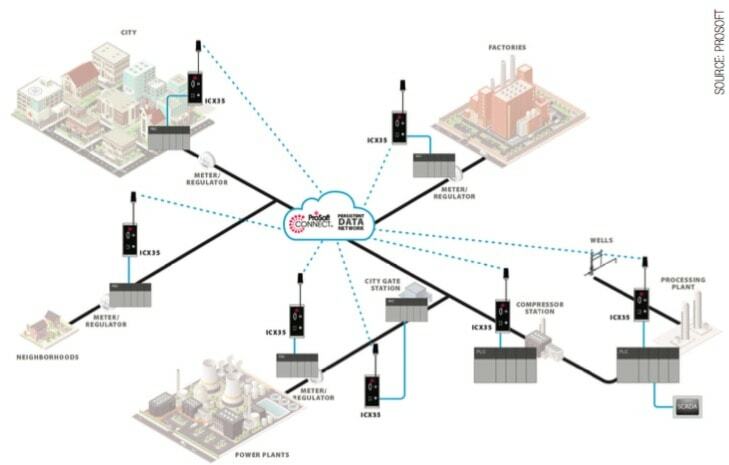 The control plane connects to the city′s remote access gateways′ maintenance and control functions, while the data plane comprises the communications tunnel. A virtual lockout-tagout capability can also help in controlling access to equipment during critical tasks, increasing safety of distributed workers and devices. A primary benefit of this type of solution – and one that Prakash has heard praised from beta testers of the Persistent Data Network – is the speed at which it can be deployed. "In my experience, I′ve never seen the ability to set up a telemetry communications network so easily," he said. "You can literally set up a network and deploy it in minutes." This streamlined process allows the utility to focus more on process and service availability, ensuring critical needs are met within the area. With previous hardwired solutions, that extra time would be focused on equipment maintenance or often unnecessary travel to sites within the service area. Prakash notes that the East Coast utility mentioned at the beginning of this article is already seeing dividends. "They′re saving thousands compared to their older RF solution," he said. "But more than anything, they′ve told me that they like how easy it is to add a gateway to each station. That′s helpful today and as these smaller service areas grow in the future." Lauren Robeson, Global Communications Specialist, ProSoft Technology.